What day is it? Why am I in the kitchen? When was the last time I showered? 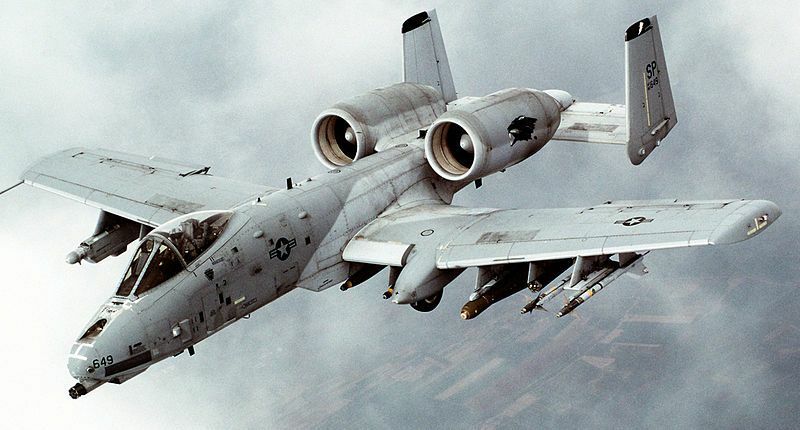 About a week in to my ownership of the A10M, I felt exactly the same as about a week in to my first newborn; haggard, exhausted, disorientated, scared, lost, and filled with a complete sense of awe and wonderment that is this life change. As with any piece of technology, 3D printing has gotten cheaper, better, and more available. Because of this, I decided that it was time for me to get into a “cheap” DIY 3D printer kit. Today, we will talk about about the reasons why I am now the proud owner of my very own Geeetech A10M, and what my initial experience as been. I am going to start on a positive, the printer, accessories, and goodies that came in the big brown box. Inside was the instruction sheet (color, glossy, double sided – not a ton of information), the upper and lower gantries, the LCD/control panel, power supply, bolt pack for attaching the upper gantry and the control panel to the lower gantry, textured heated glass build plate, two extruders, two spool holding bracket kits, a 1 Gig SD card, a baggie with a replacement for EVERY screw/bolt on the printer labeled “backup bolt pack”, two spare Teflon tubes, a sample of wood filament, a sample of unmarked filament (presumably PLA), spare blue rubber to fill the extruded aluminum rails, and a mouse pad. Phew… that was a lot. It seems strudy and reliable. Everything is metal or glass, the only plastic is in the connectors. Assembly was easy enough, I just followed along with the enclosed sheet. It took me about an hour to get everything put together and setup. The A10M, All put together ready for calibration. Overall, this is a pretty complete kit, with everything (less one item) you need to start 3D printing. Which is a good starting point. There are a few things that I can do that will help my prints, protect the machine, and make my life easier. But that is part of why I purchased a DIY kit is that I enjoy tinkering and improving equipment. It is my hobby. What was NOT in the box leads us to the next bit I want to talk about. I suppose it makes sense to explain why I purchased the A10M and from where, before we delve into my first week experience. 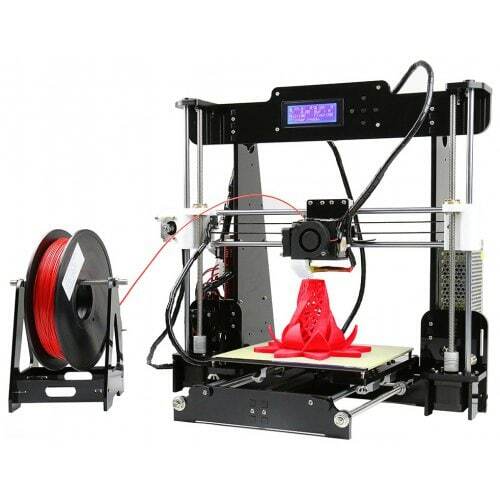 I originally was planning getting a Anet A8 Prusa I3 kit. This is an inexpensive printer (~$200 USD) that rates well and looks like a great entry into the realm of 3D printers. During my research of the A8, I stumbled onto the A10M from Geeetech. This printer is also based off of the Prusa I3, but it comes with two extruders and a two in, one out hot end and nozzle. The A10M is about $100 USD more than the A8. I figured that extra $100 would be well spent to have the option for two colors, or maybe to have PVA support material. There are two official add-ons for the A10M, the WiFi adapter (which I passed on), and the 3D touch Z axis sensor. The Z axis sensor is a super useful addition to ANY 3D printer. It allows you to “automatically” level your build bed, or at least record the offset to level at various points on the bed. This was something that I wanted to have, and to have from day one. When I purchased my printer from 3dprinterbay.com, it was on sale for $235, with free shipment from California. This was a good $65 USD cheaper than the seller on Amazon, who was out of stock. I went ahead and ordered the printer and the 3D Touch Z-Axis sensor. Then, after the four business day processing period, my waiting for the big brown truck could begin. On the day my newest purchase arrived, I was eager. I opened my box, looked through the contents, and there was no 3D touch sensor. 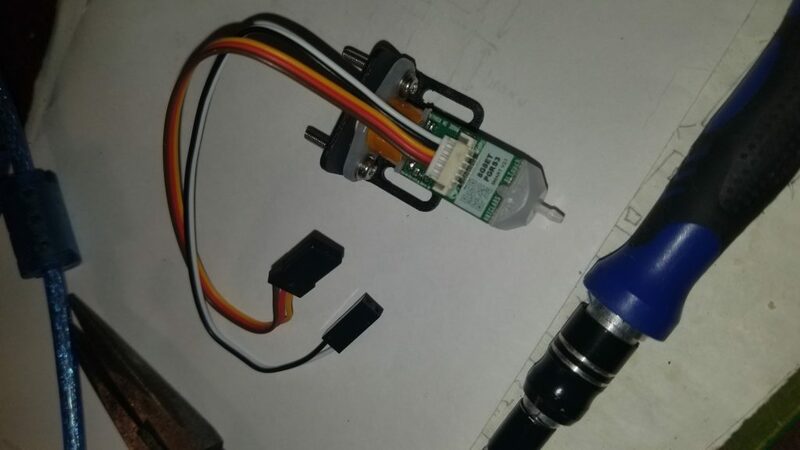 After emailing the market place, and waiting several days, I found out that the sensor is being shipped from China, separate from the printer. I imagine that this is because the California warehouse was out of stock. So, after two weeks of ownership, what are my thoughts on the GeeeTech A10M? The printer kit itself is amazing, you are assuredly getting what you pay for. The machine is solid, and complete (except the Z axis sensor). Things are probably not 100% true and square (I have a sheet of paper folded a few times acting as a shim for the one corner), but the quality of my prints hasn’t suffered. The electronic brains of the operation are driven by tried and true open source software. This means you are not tied to whatever firmware the manufacture has made for it. Because the board is based off of popular embedded processor, firmware updates are done via the very easy to use Arduino IDE. The 2 in, 1 out extruder opens up a whole another world with printing possibilities. That said, knowing what I know now, I would have changed a few things. 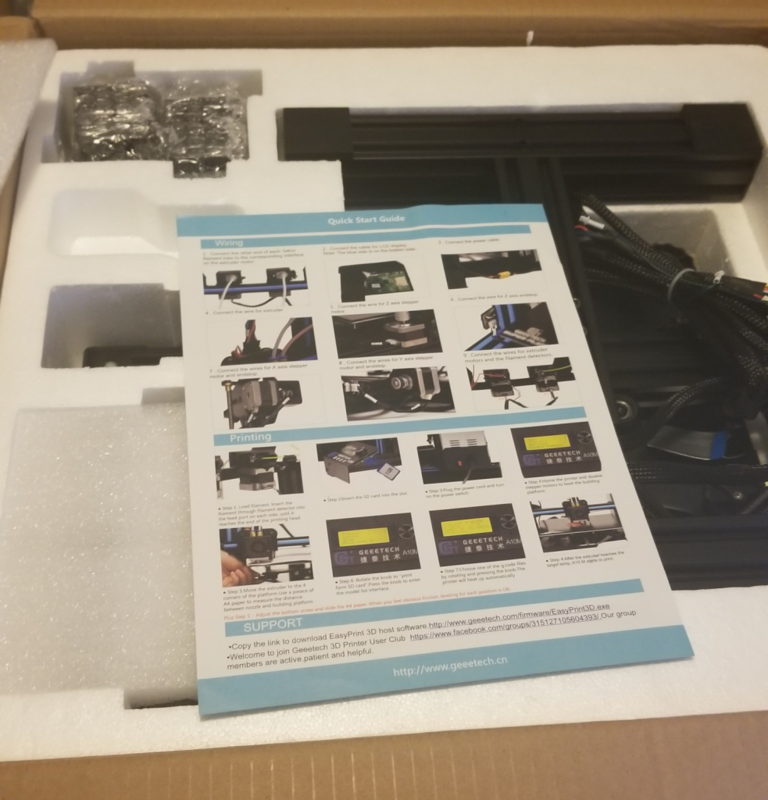 The lead time on the printer was well worth the discounted price I paid, but I would have ordered the Z axis sensor from a different source to have it from day one, rather than over a week after the printer arrived. I also wish there had been some more user interface information included, or made readily available with the kit. Being my first printer, and truly first experience with the Marlin firmware, I made some mistakes setting things up for my first few prints. As a result, I have scratched some spots on my nice textured glass build plate. At $25-30 to replace, I will likely live with it (at least for the time being). Overall, I am super happy with the A10M. It is a very capable and versatile printer. 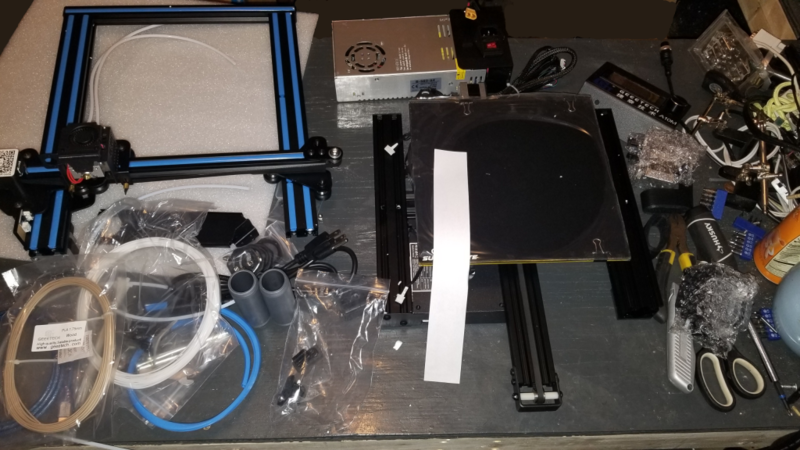 The included heated bed makes printing PETG possible, though larger parts may require some additional help (click here to read about some of them). The large print volume means I will be able to print much larger and useful parts. I really feel that this will fit my needs and wants in 3D printing for what I want. 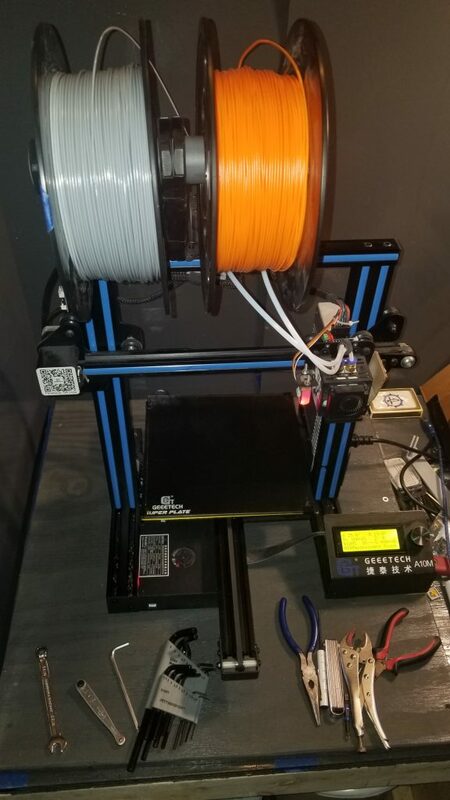 I am going to include links for some other information regarding my A10M here: Initial setup of the printer, my enclosure project, customizing and updating the printer’s firmware, planned and implemented mods. I hope you found something of worth here, please share your thoughts and questions in the comments. If you would like to help support us as we work on bringing new things to life, you may visit our Patreon page. If you are interested in commissioning a new product or idea, feel free to visit us on Fvver.